Gutenberg Blocks for Food Bloggers - Feast Design Co.
There’s confusion sometimes about what a “recipe” is on your blog. A recipe is a wordpress post in it’s entirety, which includes not only personal information about you and why your readers will benefit from your particular version of a recipe, but also the recipe data itself. The line can be blurry sometimes, but it’s helpful to think of the actual cooking portion (ingredients + instructions) as the recipe data, which is handled by a recipe plugin. A “recipe index” page for example, is an index of recipe posts on your blog, and these recipe posts are simply called “recipes”. A recipe index page does not list a bunch of recipe data that you input into a plugin – it lists a bunch of recipe posts, of which a recipe plugin is a component. However, the raison d’être of the of the recipe is the post itself, with your unique views and take on that recipe. There are thousands of nearly-identical chocolate cake recipe instructions out there, but only you know why the ingredients in this particular one are special for you. Articulating the benefits the reader will get from using your particular ingredients and instructions is the heart and soul of your recipe. Recipe plugins such as Cookbook, WP Recipe Maker and Tasty Recipes insert code into the website, which isn’t displayed on the website itself, but is used by search engines to understand the post and present it to people who search for it. This code is known as “structured data”, and labels each part of a recipe according to to a specific format as defined by schema.org. You can learn more about the basics of structured data from Google and view the schema.org/recipe format here. Rather than manually write the structured data out yourself each time you create a recipe, using a recipe plugin which has these fields pre-defined means that you don’t have to worry about inserting this manually, and more importantly, staying up to date with the latest specifications. As the schema requirements change (and they change constantly), the plugin developers release updates that will automatically bring it up to date for you. The small price you pay for a recipe plugin is quickly paid for by the hours saved learning how to comply with this structured data (10+ hours to start), time spent writing the structured data per post (30+ minutes per post), and time spent editing previous posts (10+ minutes per post edit) when the requirements change. At even 1 recipe per week, you’ll have saved 10+26 = 36 hours in your first year alone. The WordPress 5.0 update (codename: Gutenberg) will change how posts are written and formatted in WordPress, and lays out an interesting proposal for content development and workflow with the concept of “blocks”. You should read this great writeup on Gutenberg from Yoast. Blocks are the inspiration for this article. They break down your post into manageable “chunks” that have a pre-defined purpose or role. Recipe plugins are already part way to being “blocks”, having pre-defined fields for carefully defined parts of your recipe data. The other parts of the recipe anatomy will become “blocks” in future releases of our themes. This will streamline the recipe posting process and make it easier to post. From a technical standpoint, they’re another layer of abstraction on top of WordPress and the underlying PHP code base. It’s a way to define certain areas to add extra data (such as structured data for a recipe plugin) behind-the-scenes. A simplified version is that everything is being broken apart and wrapped in HTML <divs> – you’ll have a div for your image, you’ll have a div for your recipe ingredients, you’ll have a div for your videos, you’ll have a div for your newsletter-sign-up-call-to-action, and on and on. The content inside those divs will behave differently depending on which one you choose to use. Instead of a free-form text editor, you’ll get a bunch of fields to fill in, making your life easier. 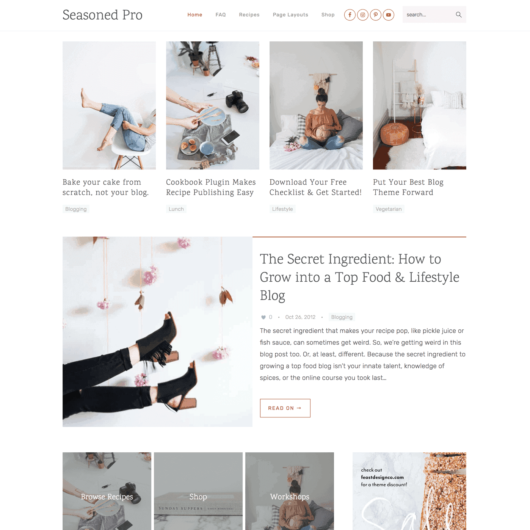 Feast Design Co.: Bake your cake from scratch, not your blog. This is a preliminary introduction to our development road map over the next few months (maybe years? ): to help set food bloggers up for success so that they’re not baking their blog from scratch. 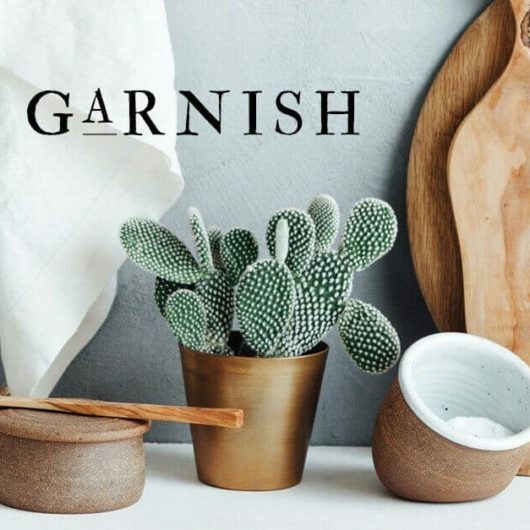 We’ve codified this into a set of Best Practices and Principles that revolves around keeping you focused on creating recipes, baking and posting, instead of figuring out the nitty-gritty technical aspects. Q: Do I need to update all my previous recipes? At the moment, it looks like the Gutenberg update will allow you to leave your old posts as-is with no ill-effects. You’ll even be able to continue working with the old editor, which has been renamed the “classic editor” and provided as a separate plugin. If you are already using an old recipe plugin, that does categorize, do you think this will be sufficient? Or will updated to a newer release plugin be recommended? Also, if you do go to a new plugin, is configuration to that new recipe plugin automatic or will recipes need to be manually all updated? That depends on how thorough the import process from one recipe plugin to another – some outdated plugins simply didn’t have certain fields or settings when they were created. You’d want to reach out to the new recipe plugin for specifics. The categorization of the WordPress post is different from the recipe plugin however – WordPress categories should carry over fine. I always end my posts with questions for readers and my signature. If there was a content block for that I would love it. The way I’m doing things now looks kind of slapdash. Thanks Jennifer! Consistency is the key, especially as standards change over time. A question block is a great idea! This post is soo helpful. I’ve been having difficulty organizing my recipes and etc. So thank you. Glad you found it useful Anecia 🙂 If you take it slowly and don’t rush into it, you should do fine. 3. A “shop the post” content block where you can insert code for shopping widgets that may contain kitchen equipment/tools etc that you use to make the recipe.